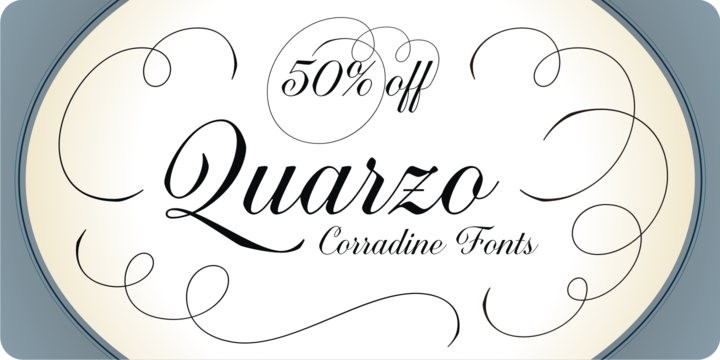 Quarzo™is a beautiful script font created by Manuel Eduardo Corradine, Sergio Ramírez. Inspired by the flexible nib to fashion a concatenation of perfection, the font also ensures idyllic character using a blend of contrasted strokes and distinct yet rounded angles. Texts created out of this font will have a uniform rhythm due to its stability on angle and spacing between the strokes. The font is also celebrated for giving a dramatic touch to texts via using a wide range of glyphs with curly and sophisticated embellishment.